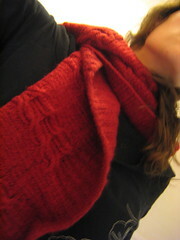 First, yay for more finished lovemeknots. Thanks for the comments about the felting. I think Lisa is right about handknit + washine machine = bad idea, even for yarn with that nice little "machine washable" label. I have to ask though, what is it with knitters and felted bags? I'm not making a bag. Taking Ysloda's lead, I'll give you a "pictorial" guide to what I have done. They are all thumbnails, click on them to see larger version. 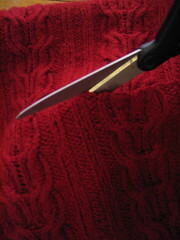 Cut down the middle of the back to the next armhole. Ta-da! 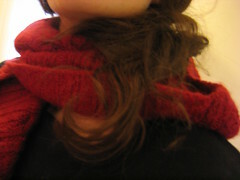 A Scarf. 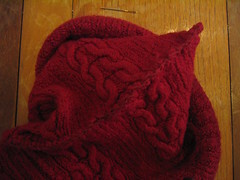 A (little red riding) hoodscarf. Complete with fairy-tale pointy top. Red riding hood was delivering cookies to her Granny. Both my Granny's died years ago, but I've always had a great set of Great Aunts. One of my aunt's died last week, another is very ill in hospital. This scarf is in honor of them both, and all other "mature ladies" (aunts, neighbours, grannys, members of knitting groups...) who deserve spoiling with cookies once in a while. That said, these cookies are going to a friend for his 26th birthday. I'll save one for my Graddad though. And maybe my little brother if he's lucky. Well, apparently you're completely over the trauma of having felted your handknit. I'm still in shock. I think the picture of you cutting right in the middle did it! I love the scarf! 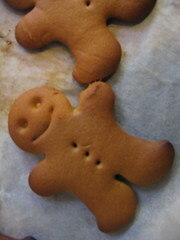 I also love gingerbread men... what a post! I knew you were a genius. I'm really sorry to about your aunt. I hope the other gets well enough to eat lots more biscuits. Those photos are great! I love it. 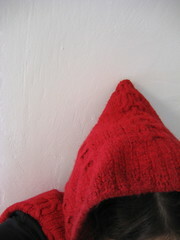 The pointy top, the felted cables, all of it! Wow, that's so much better than a bag. I bet it's really warm too. And I don't know what it is about felted bags either, they just seem like the thing to do with felted wool. Hey, I LIKE felted bags. I have to be contrary. I put a pair of superwash socks (my too-big jaywalkers) in the wash with hopes of shrinking them slightly but if anything they got bigger. The scarf hood is cute though! Excellent salvage! And your cookies are adorable. Is there any possibility of you posting your scarf/hood pattern or where you found the pattern? 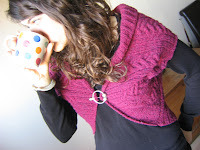 I have been searching for a pattern for this exact project!